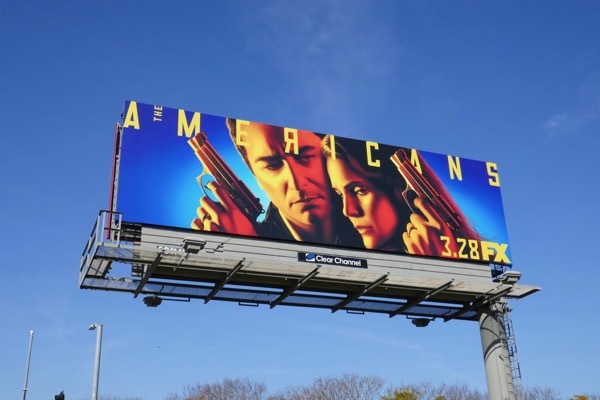 This year The Americans comes to an end with its sixth and final season, which is a relief really as Daily Billboard is not sure how much more Russian meddling we can all take. 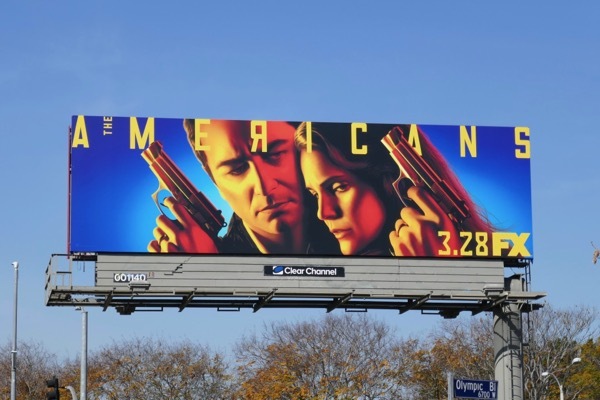 The critically-acclaimed 1980s espionage drama starring Matthew Rhys and Keri Russell sees the deep-cover married KGB agents doing Mother Russia's bidding in Washington D.C., stealing secrets, manipulating unwitting assets, infiltrating targets and killing for the cause if necessary. 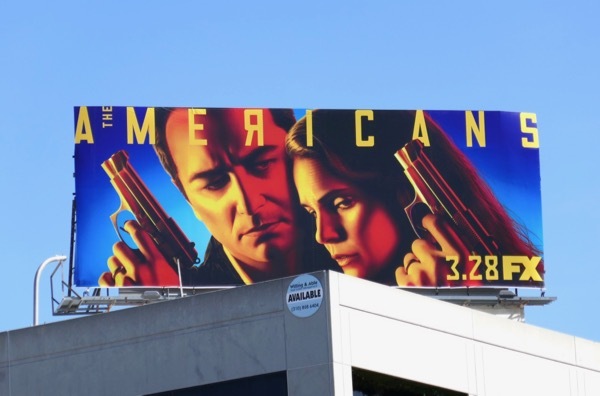 This season will 'Philip and Elizabeth Jennings' finally be discovered, or will they choose to defect or return to their Soviet homeland, with or without their two children, 'Paige' (Holly Taylor) and 'Henry' (Keidrich Sellati). It seems spycraft is a family affair and Paige is certainly a candidate to operate on American soil being born here, but will their FBI neighbour 'Stan Beeman' (played by Noah Emmerich) finally realise his best buddy that he shares the occasional brew with, and his wife, are actually his enemy? 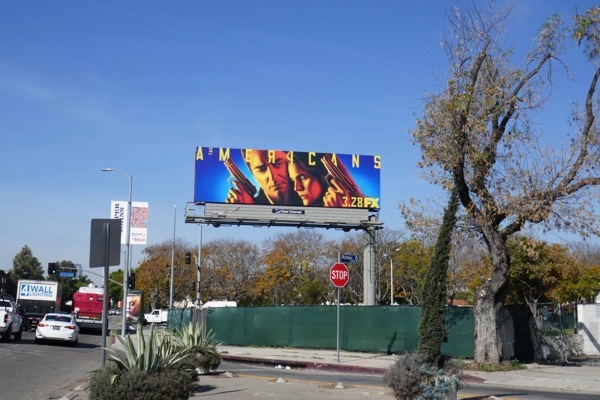 These striking season six billboards were spied along San Vicente Boulevard, La Cienega Boulevard and Olympic Boulevard on March 7, 2018. 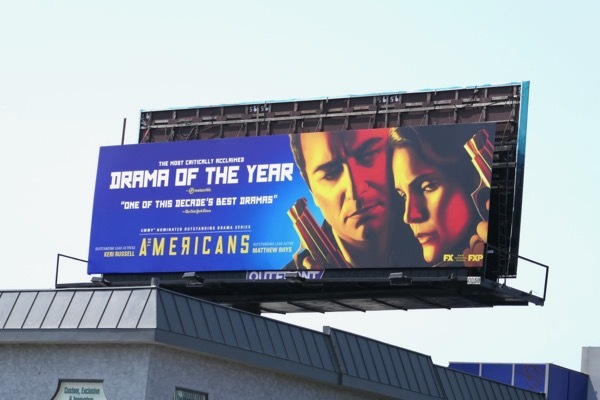 Fans of the Cold War spy drama can also enjoy all these previous season and awards consideration billboards for The Americans from 2013 to date. 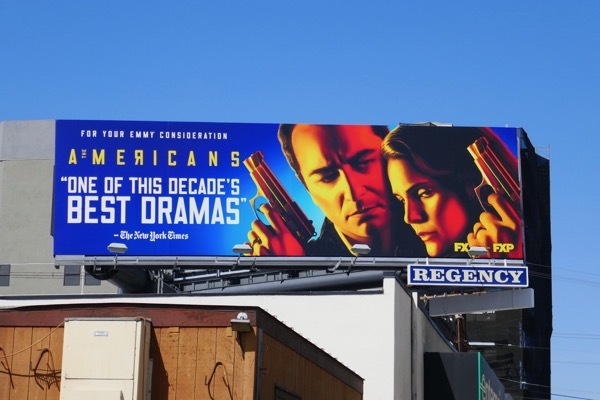 The Americans has been a riveting series and in light of what we know today about Russia's clandestine operations of late, all the storylines about sowing political and civil discord, blackmailing U.S. citizens because of their shady pasts and turning them into assets (which should be the stuff of spy novels), seems all the more prescient and timely. After six seasons of intrigue, emotions and escapades, is it wrong to wish these Russian spies a happily ever after? 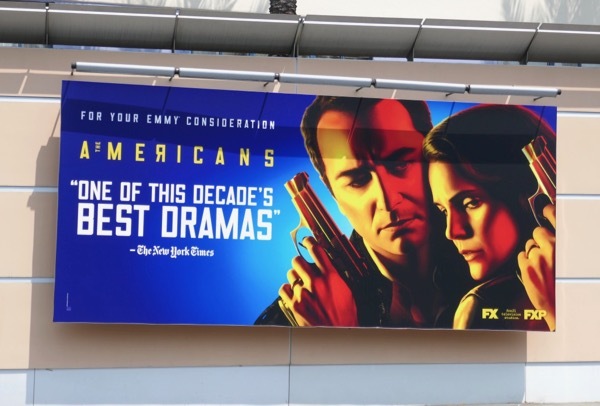 UPDATED: Here's also an Emmy billboard for the satisfying and superb final season, spotted along Olympic Boulevard on June 15, 2018. 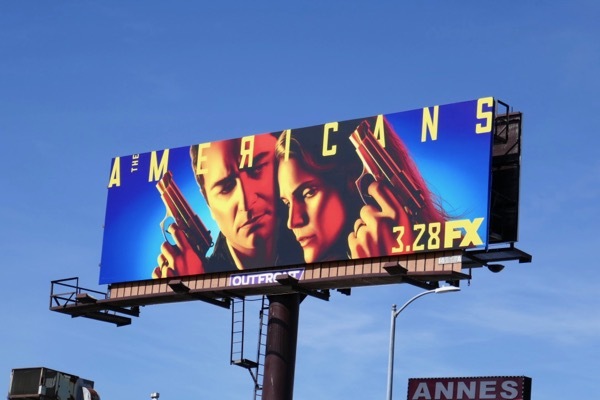 UPDATED: Congratulations to The Americans for its four Emmy nominations for its final season. 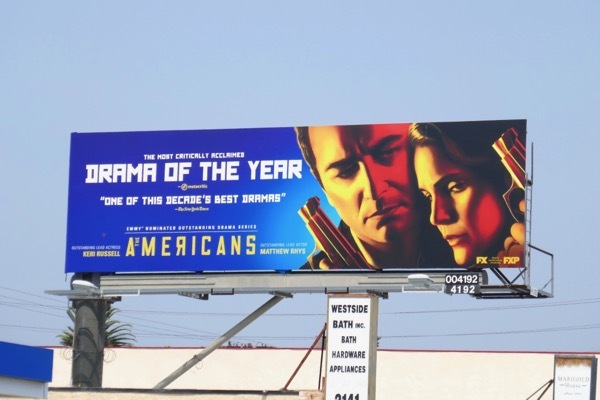 Both Matthew Rhys and Keri Russell were recognised for their superb acting, whilst the gripping spy series also garnered nods for Outstanding Drama Series and Outstanding Writing. 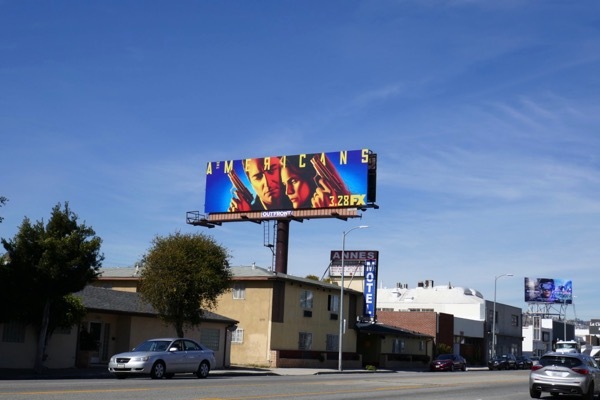 These Emmy nominations billboards were spotted along Pico Boulevard and Westwood Boulevard on July 28, 2018. 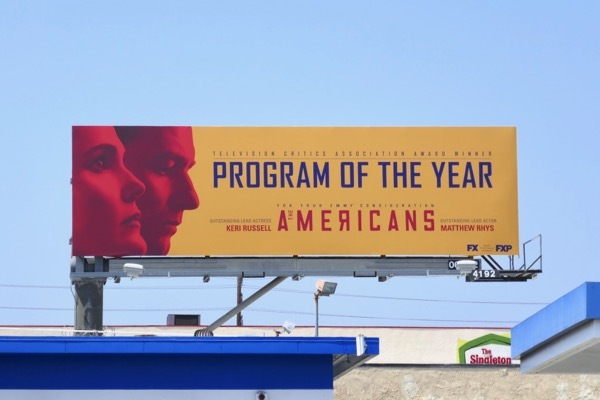 Let's hope The Americans can steal some well-deserved prizes this awards season. 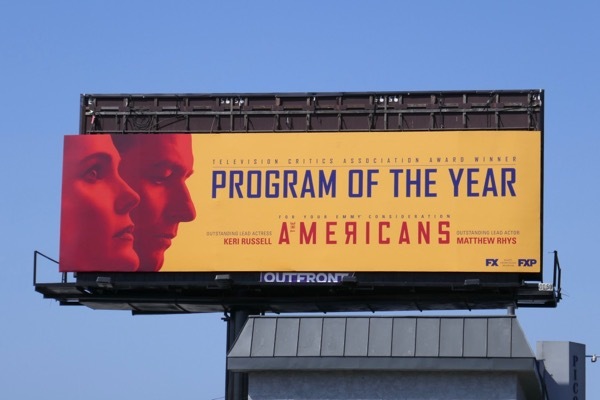 UPDATED: Here's also a totally different Emmy nominee billboard for the 'program of the year', spied at the intersection of Westwood and Olympic Boulevards on August 17, 2018. And here's another colourful example spotted above Pico Boulevard. Let's hope they do the trick.